(Due to limitations of space only the plenary lectures are listed below.) Synthesis (22 papers). Synthesis of zeolites (R.M. Barrer). The synthesis, crystallization and structure of heteroatom containing ZSM-5 type zeolite (M-ZSM-5) (X. Ruren and P. Wenqin). Structure Determination (33 papers). Zeolite structures: some common misconceptions and pitfalls (W.M. Meier). Characterization of zeolite catalysts by MAS NMR (G.T. Kokotailo et al.). Technology and Application (24 papers). Natural zeolites: processing, present and possible applications (R. Sersale). The synthesis of zeolites with desired structure and properties is of great importance for the preparation of highly active and selective catalysts for inorganic and organic reactions. The zeolite matrix offers unique possibilities for carrying out molecular shape-selective catalysis and this places the zeolite matrices among the most successful tools used in molecular engineering on a large scale. These proceedings cover the most recent developments in the fields of synthesis, structure determination and technological use of zeolites. The papers give detailed explanations of the processes involved in the mechanisms of zeolite synthesis. Special attention is focussed on complex ionic equilibria which occur in the starting hydrogel, to the templating effect'' and to the kinetics of zeolite formation. New powerful methods for structure determination of these materials, which usually consist of small crystals, are presented e.g. neutron diffraction and X-ray diffraction using synchrotron radiation. The distribution of tetrahedrally coordinated framework-constituent elements and their interaction with adsorbates is revealed by using high magnetic field nuclear magnetic resonance with sample spinning atmagic'' angle (MAS NMR). Quite a number of articles are devoted to the dependence of the physico-chemical properties of zeolites on the parameters set during their synthesis. 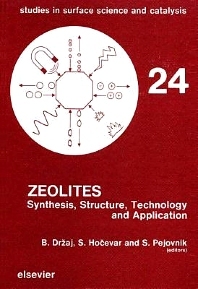 Descriptions are given of the possible technological use of synthetic zeolites in the fields of adsorption, catalysis, the production of laundry detergents, the removal of radioactive wastes, and the technological use of natural zeolites in the fields of animal feeding, municipal water treatment, paper and cement production, and energy storage. This book will be of interest to scientists working in the fields of catalysis, surface science, inorganic chemistry, materials science, petrochemistry, solid state physics, crystallography and geology.